I currently only have two original disc recordings by Daisy Kennedy. Thanks to Cheniston Roland of Violinland, I’ve been provided with an interview with her and her Beethoven Romance recording as well as several early solos with piano accompaniment. 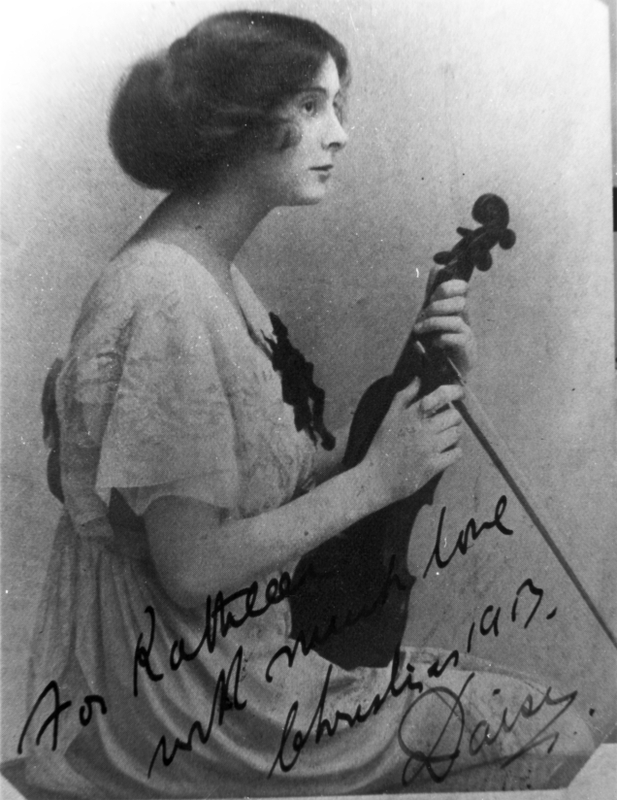 Acknowledgement: Many thanks to Phil Williamson for the photographs and additional information about Daisy KennedyDaisy Kennedy (16th January 1893 – 30th July 1981) was an Australian violinist. Her father, Joseph Kennedy, was headmaster of East Adelaide School, and her brother was a magnetician in an early Antarctic expedition. 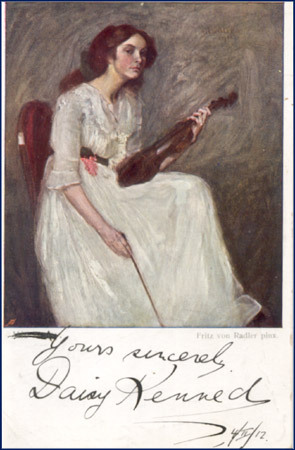 Daisy studied with the famous Czech violinist, Otakar Ševčik (1852 – 1934) (Ševčik taught in Prague from 1892 to 1906, Pisek from 1906 to 1909 and Vienna from 1909 to 1918, returning to Prague until 1921, before travelling as a teacher). Kennedy appeared in London in 1911, and toured across Europe and the US, Australia and New Zealand. She married the pianist Benno Moiseiwitsch in 1914. Their daughter Tanya Moiseiwitsch (1914 – 2003) was a well-known theatre designer. They had a second daughter, Sandra. The marriage ended after 10 years, when Daisy met and fell for the English playwright and poet John Drinkwater (1882 – 1937). 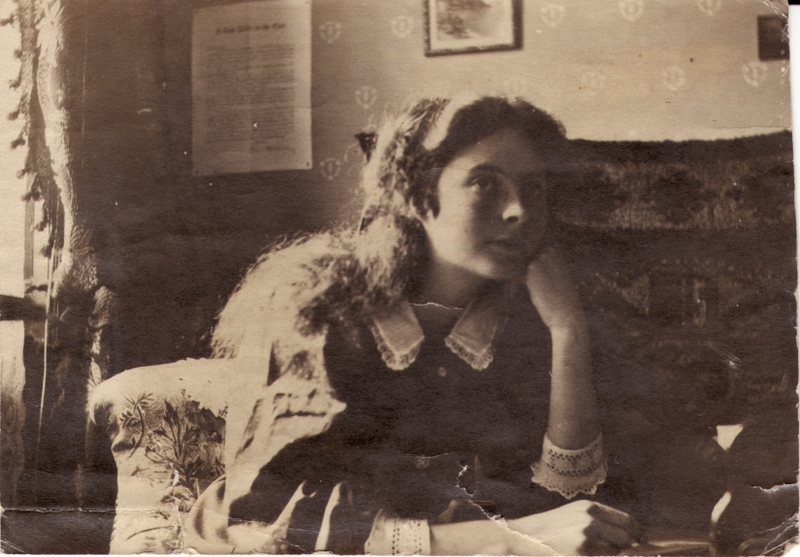 The two married in 1924, and had one daughter, Penelope.Daisy gave the first broadcast performance of John Ireland’s 2nd Violin Sonata, on 13th March 1924, with the composer at the piano. Maurice Moiseiwitsch’s book about his uncle, “Moiseiwitsch – Biography of a Concert Pianist”, conveys a very positive impression of Daisy Kennedy, despite the fairly short marriage. It is worth noting however, that the book was written without consulting Benno’s family and therefore has omissions and errors. Daisy did not perform much during her marriage to John Drinkwater, The biography comments that when Drinkwater died, Daisy was compelled to take up performing again after a long break (see comments below). “Daisy was a very close friend of my grandmother’s (Kathleen Holder) when they were both pupils at the Adelaide Elder Conservatorium, and my grandmother stayed with Daisy for nearly 16 months when visiting England in 1946/7. When my grandmother was in London, Daisy had been reduced to leading the orchestra at the Regent’s Palace Hotel. “Talking with my father, he said that when he was serving with the RAAF in WW II, Daisy very kindly took a day off work and showed him around London on one of his weekend leaves. She was never financially well-off in her own right, and the sudden death of John Drinkwater probably left her, with several young children, in rather a bad situation. She had got “off-side” with many influential people through her divorce from Benno (it is said that John Reith of the BBC was horrified when she was broadcast on the radio, as she was a “bad influence” as a divorced woman), and it was then that she took the Regent’s Palace job. I think she may have had some of the fiery temperament which goes with red hair. 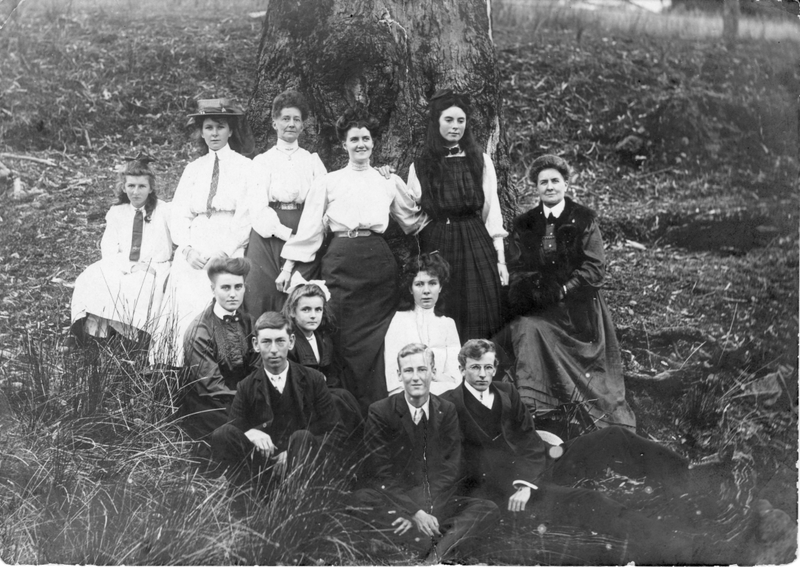 Students from the Elder Conservatorium on a country outing, about 1907/8. Daisy is the girl in the dark tartan dress in the back row, and she has her hand on Kathleen Holder’s shoulder. The postcard is probably from 1912. The postmark looks like 16.Nov, with a 1 at the start of the year and a curve of the final digit of the year, suggesting 1912, 1913 or 1918. 1913 is unlikely, as November 16th was a Sunday, so 1912 would seem the best choice. 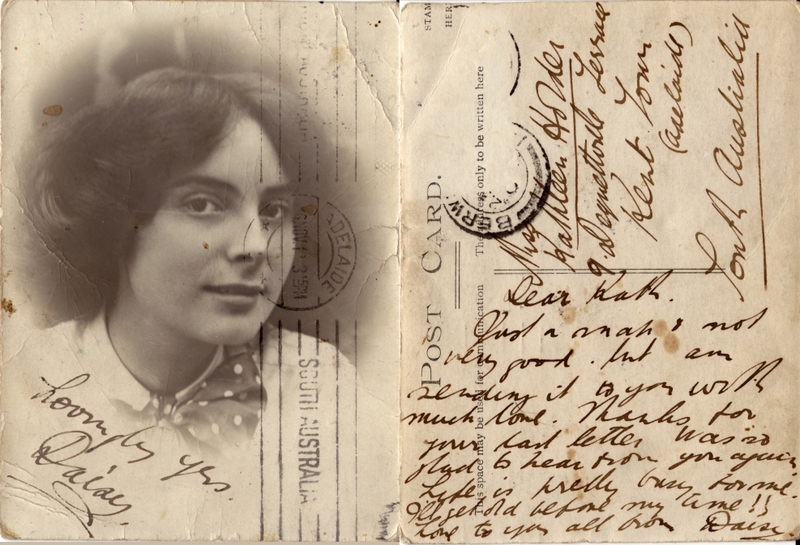 As a further addition to this Daisy Kennedy collection, Cheniston Roland who has a fascinating site on the violin very kindly sent me the following images. And secondly a page of reviews of her American Debut in November 1920, advertising her second recital in January 1921. Also thanks to to Cheniston K Roland for providing a copy of an interview with Daisy Kennedy, broadcast on BBC Radio 4 as the interval feature of a concert conducted by Rafael Kubelik on April 24th 1969. (Thanks to Colin McLeod for details of the broadcast date.) 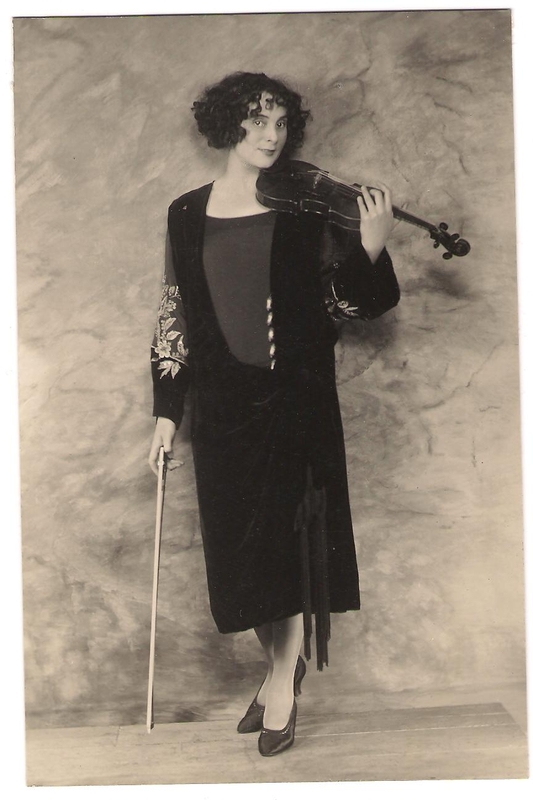 Kennedy reflects on how she began to learn the violin, playing for Jan Kubelik, studying with Sevcik, and working with Landon Ronald, Percy Pitt and Henry Wood. Announcer: And now, Daisy Kennedy, the violinist remembers her early life in music. The Kubelik she refers to is Jan, the father of Rafael Kubelik who’s conducting tonight’s concert. Irene Slade: You were found to have musical talent when you were very young, weren’t you. How was this discovered? 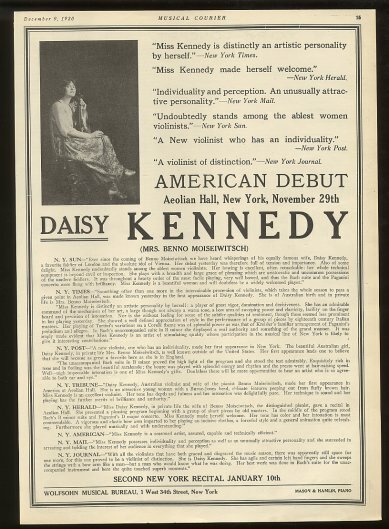 Daisy Kennedy: Well, originally, I was taught the piano by my mother when I was four, before I went to school. But by the time I was seven, a very amusing thing happened: one very hot Sunday afternoon, father and mother were resting and we were told to be quiet, and my mother said to my father, “I do wish our neighbours next door would stop playing the piano only in the key of C.” Father, being an argumentative Irishman, said, “How do you know it’s the key of C?” And mother said, “Well it sounds like the key of C,” so father got up and went to the piano and struck the chord of C and it wasn’t. “There you are,” he said. “We’ll have the children in and see if they’ve got absolute pitch. I don’t suppose any of them have.” So he tried us all in turn, and I was the last. And none of the others could tell any key of any notes. Then he tried me and found that I could tell him any key of any notes, even if he put both hands down over a series of notes top and bottom. Then he tried me with whistles and chair squeakings. So he said, “She’s got absolute pitch, she’ll have to learn the violin. The piano’s a waste.” And he brought home a little violin, it was a half size. He couldn’t find one in Adelaide anywhere in one of the shops. Eventually, in a pawnbrokers, he found this little baby violin, I think he paid 25 shillings for it. Now, I fell in love with it at sight, and just loved holding it up to my neck. Straight away, yes. With a very charming woman from Austria, who played very beautifully and had a very beautiful family. Did you concentrate more on your music than on your lessons at school? Always. I was always doing everything I could to stay away from school to be able to play the violin more. I played at students’ concerts every year, and occasionally charity concerts, of course. And I was growing very, very tall. By the time I was fifteen, I was as tall as I am now. In fact even taller, because I think now I’m beginning to shrink a bit. But I was about five feet nine. I was very tall, with long red hair and lots of freckles. And I used to streak through Adelaide with a fiddle, everybody knew me. How was it that you eventually came to Europe? So this money was taken out of government bonds, and my sister went with me and we left for Europe in December 1908. I left Australia, you know, in blazing heat, I think it was about 110 in the shade. But when we arrived in Prague it was deep snow and ice, which of course I’d never seen before. How long were you in Prague? Oh, not very long, because while I was studying there, Professor told me he’d been appointed Professor at the Meisterschule, the Master class of the world for violin playing, in Vienna. And he said I should come with him. I said well how could I get in the Master class. “Well,” he said, “you can try.” I said, “How many will you be allowed to have?” and he said, “Only ten. But I shall still take private pupils.” So I said, “Well how do I manage to do that.” He said, “Well, come to Vienna and work hard all the summer.” Well, we found very inexpensive digs, but the first night we had an invasion, my sister and I, and we were bitten to pieces by those dreadful things called bugs. Not the American type of bugs, the bed bugs of Europe. It was terrible. So we moved the next day and tried again. The same thing happened. And the third night was the night before my examination, and again the same thing happened. And then I had to play a concerto, I think it was the Saint-Saens I prepared, and some unaccompanied Bach, and various other small pieces, and before I’d finished, the board of examiners said, “We’ll accept you. On temperament alone,” but I didn’t dare tell ’em it was bug bites gave me that different temperament. I was simply mad with irritation from top to toe. You must have heard many great artists in Vienna. Who were those who impressed you most? Well, from the violin point of view, the four outstanding influences, shall I say, on my own emotions and thoughts on violin playing were four utterly different types of players and temperaments and people and personalities. Eugene Ysaye, the Belgian was dynamic and dramatic. He would stamp his foot, and he would give a leonine performance. Sometimes you only heard the bottom and the top note of a run, but it was thrilling and exciting, and his interpretation was always vivid and unforgettable, and he had the most exquisite pianissimo I think that I’ve ever heard. Then Kreisler – what a touch! He had these natural finger pads. They gave a quality to his playing that went straight to your heart, you didn’t stop to think, you only felt, every note that he played. Sometimes he would not be as good as others, but it didn’t matter, because this pure personality and tone and exquisite emotion came right through every time, it never failed. Then there was Mischa Elman. He had perhaps the biggest boldest and most thrilling tone of all, but he was too excitable to control it. He once played the Tchaikovsky Concerto, and at the end of one of his dramatic passages, the bow left his hand and flew out into the audience, which was picked up quite close to me and returned to him just in time for him to come in for the next part. Then there was Karl Flesch. He was quite different. He was very calm, some people thought he was cold. But his playing was silver pure, and I think his performance once of the Beethoven concerto, to me, was perfection, and I’ll never forget it till I die. In 1911, Sevcik brought six of his best pupils to London. Each had to play in a Queen’s Hall concert, and give a recital. Daisy Kennedy was a great success, and after a brief return to Vienna she came to London to stay. All she had in the world was five pounds in cash her fiddle and a letter of recommendation from Sevcik. Then came the exciting news, a letter from Sir Landon Ronald, offering me an appearance at his famous promenade concerts in Birmingham. And he asked me to play the Tchaikovsky Concerto. The fee he offered was 2 guineas. So I thought, well, now I can’t start at 2 guineas, I might never get any higher. So I wrote a letter and said I was delighted to appear with him and looked forward to it immensely, and was very proud that he had chosen me to play at his concerts without ever having heard me play at all. But Sevcik’s magic letter did the trick. But I did say I’d rather not accept the fee of 2 guineas, I’d prefer to come and play for nothing. He wrote back and said, “Don’t be a silly child. Come and play, and perhaps we’ll do something.” And when I did go and play, he was wonderful. He was the best accompanying conductor I have ever known in the world in any country at any time. Whatever you did, he was behind you, and had the most sensitive understanding of your tempos, of your tone, of your interpretation. And I was thrilled to play with him that night, and he was very excited about my performance. And in the artists’ room afterwards he said, “Now. We’re going to give you our maximum fee.” And of course I was simply excited, I couldn’t think what was coming. And he said “Instead of 2 guineas, we’re going to give you 5.” And those days of course, it was quite a lot, really, because, we used to travel to concerts and we got special rates in every city in England, we would get for 10 and 6 a jolly nice room, very good food, a bath and all pleasures and conveniences. Well, then I came back to London, and there was the engagement for Queen’s Hall, Promenade Concerts with Sir Henry Wood. And he offered me 3 guineas without every hearing me play. So I felt, well, looking up, but I didn’t get it doubled. And from then on I think I played for about ten years of Promenade concerts and then there were various recitals, there were dates up in the north and provincial concerts all over Great Britain. Do you remember your first appearance at the Albert Hall? Oh yes, I’ll never forget that. In those days, the artist room led from a, well through a corridor, up a steep flight of stairs, and you emerged onto the platform. And I had designed, and had made, what I thought was a charming pleated chiffon green dress. I’m not superstitious, though I like wearing green. And Sir Landon said, “Now, I will take you onto the platform, to introduce you to the Albert Hall.” Well I knew I had my fiddle and bow to carry, and this steep staircase to negotiate, and I thought “What will happen to my dress? I can’t hold it up if he holds my hand.” But Landon had a very commanding way with him, and up we went. But before I got to the top, I put my foot through the dress, and it tore away from the high waisted.. yoke, I think you’d call it. And yards and yards of green chiffon, pleated, was laying all over the platform. I stood in a sort of sea, and played the concerto which lasted I think about 40 minutes. I couldn’t move. And then he had to help me off. You were one of the first musicians to broadcast, weren’t you? Yes, I think it was in 1922, when I started to play again, I was invited to play at Marconi house, and also at Savoy Hill. Was it considered a good thing for your reputation that you should broadcast? Well even Sir Landon Ronald, my very dear friend and mentor said, “You’re not wise to play, because you will never be able to play anywhere else. And you mustn’t do it.” And later on he had to change his tone, because of course he did appear, frequently, in concerts on the radio, and was quite… converted, shall we say. Then of course the Promenade concerts were broadcast, weren’t they? Later. But before that, there were… the first orchestral concert in London given in public and broadcast at the same time was at the Central Hall, Westminster. And I think I’ve told this story elsewhere too, I played Saint-Saens Concerto in an all-French programme, and Percy Pitt conducted that orchestra, and that was when he gave the downbeat for the opening of the tutti for the first violins, and his baton came whack down across my fingers, which were already on the violin waiting on the fingerboard to start playing. Announcer: That was Daisy Kennedy talking to Irene Slade. The program was from a BBC Sound Archives Recording. Available from August 1920 to July 1924This was the first recording, and the only acoustic one, of this work.